PU palm coating with superior grip. 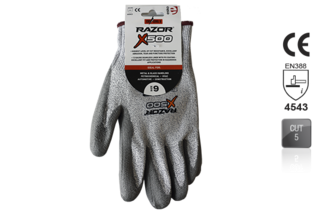 Razor X300 combines cut protection with comfort, flexibility and dexterity. ƒƒHigh dexterity and breathability, performs in dry and wet conditions. ƒƒHigh performance fiber blend knit shell. -HPPE spandex / polyester liner with PU palm coating. -PU palm coating with superior grip. -Razor X500 combines cut protection with comfort, flexibility and dexterity. -High dexterity and breathability, performs in dry and wet conditions. -High performance fibre blend knit shell. 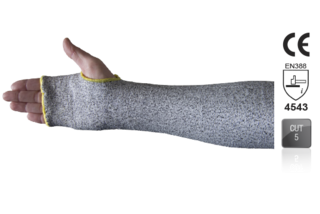 Cut level 5 protection, ƒƒKnitted from high-performance HPPE, Header-carded, ƒƒSizes: 8 - 11. 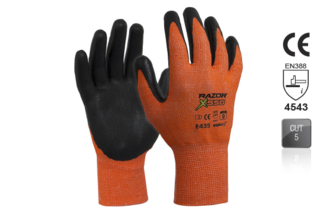 RAZOR X550 Glove, HPPE Cut Resistance Level 5, Hi-Viz Orange, Nitrile coating, Sizes 7 - 11. -Hi-vis polyester glass fibre knitted liner with nitrile coating. 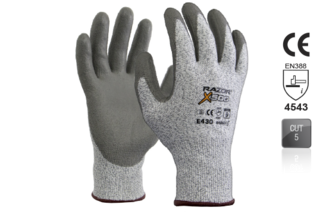 -Razor X550 combines cut protection with comfort, flexibility and dexterity. -Cut level 5 protection with superior grip. -High performance fiber blend knit shell.